My younger brother & I after the first of many Field Days. Note my burgeoning collection of 'record' ribbons weighing down my shirt compared to his solitary 'participation' pin. They gave those to the fat kids and that one guy with the cross-eyes. My age group trophy also shimmers in the sunlight. Eagle-eyed readers will also notice my complete lack of shorts. When I was a kid I was like, super fast. No one in my age group could beat me on the track. ‘Track’ is an appropriate use of the term because I’m sure goats used it at some stage. No, it wasn’t that bad. We had a field, with grass and everything. It was only just over 100 yards long, and not very wide, so the cornering on the longer races was pretty tight. You could blow out an ankle coming around the last corner just because you were hovering at a thirty-degree angle keeping your speed up. And you had to keep your speed up. One time I ran so fast I forgot my name. Could have been the altitude however. As a kid I ran barefoot, mainly because you shaved 2.5 Pounds of cheap 3rd-world footwear off your weight, that your mother bought you under the assumption that ‘cheap is just as good as expensive and no one will like you more if you buy the brand-name shoes.’ My solitary teenage years proved this notion clearly untrue. I broke all kinds of records at the beginning, and had my name on the Official Field Days records board to be cherished for all eternity. Until a couple of years later when the school changed to the metric system and everything got reset. Great. Thanks Metric System. Another reason for keeping your speed up was, if you slowed down at all, these native bolivian fleas called Niguas could do this to your foot. The Niguas preferred you wore cheap footwear. They dug under your skin if you weren’t careful and laid their eggs in there. They looked like pimples with little black dots in the middle, but had the added excitement of tiny movement if you left them long enough. A similar bonding experience to being pregnant I imagine. I got a few in the early years, but none progressed further than pimple stage (their growth hampered by my incessant need for speed) and were dug out with whatever metal implements happened to be around at the time. By yours truly. Cause I was tough. Tough enough not to let on to mum that parasites were breeding in my epidermis lest another whacking come my way for not wearing the $2 shoes she’d bought me. 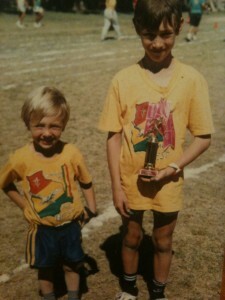 Of course, by the time I hit puberty at 28 most of the other guys were faster than me, and had been for some time. The school also changed the rules and said you couldn’t run barefoot anymore. Probably because of the parasites. That feeling of flying was gone. But those early years were the best. Just me & the Niguas, first around every corner. Posted in SchoolTagged athletics, Bolivia, nigua, runningBookmark the permalink.